Did the FBI Kill My Father? Forty-five years ago, my father, Joe Colombo, the alleged boss of the "Colombo" crime family, and founder of the Italian-American Civil Rights League, was gunned down among a crowd of thousands in one of the most highly publicized shootings in New York City's history. To the media and the FBI my father was head of one of New York's infamous Five Families. To the Italian-American community he was an organizer and leader. To his family he was a great husband and father. As Joe Colombo's son, who was responsible for my father's death -- and that the efforts he made for the Italian-American community have gone unrecognized -- has weighed heavily on me for years. I finally decided I would write a book to address who my father really was, and to address who should be held responsible for his death. The book is based on my personal life beside my father, my in-depth knowledge surrounding his shooting, and what I've come to learn was a suspiciously flawed investigation into his death. At the time of his shooting, my father had made enemies of the FBI, the NYPD, and various members involved in organized crime. In many ways, my father's shooting parallels the assassination of JFK. After all the shock and finger pointing, an official investigation embraced a "lone gunman" theory. And in both cases, the general public had serious doubts. Similar to JFK, there has never been any question as to who pulled the trigger, but the question has remained for over 45 years who pulled the strings behind the trigger man? My father's life was a classic tale of rags to riches; he was a young boy from the streets of Brooklyn, who in 1971 was voted New York Magazine's top ten most powerful men in New York and was also featured on the cover of Time. Tragically, at the height of my father's influence, on June 28, 1971, he was shot while standing inside a press barricade at Columbus Circle a few hours before an Italian-American civil rights rally. The shooter, Jerome Johnson, was immediately subdued and handcuffed by police. Johnson had posed as a cameraman with official press credentials. Minutes after Johnson was subdued he was shot and murdered while still handcuffed and surrounded by a sea of NYPD blue. 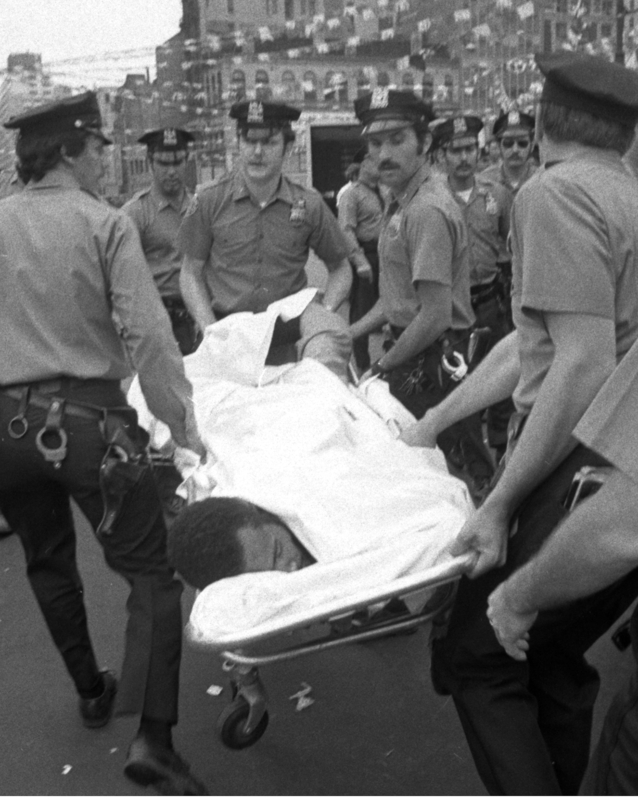 Jerome Johnson being carried to an ambulance after being shot by an unidentified shooter while in the custody of the NYPD. "On Friday July 2nd four days after the shooting, Seedman called for a special conference with the city's Chief Inspector Codd and Deputy Police Commissioner Robert Daley. Seedman had just returned from a meeting with a source in Brooklyn and reported excitedly, 'It was a Mob hit! According to my information the contract was let by Gambino himself. The price was $40,000. Furthermore, Colombo is supposed to be the first in a series of hits. Next on the list are Mrs. Colombo and the two oldest sons. It's to be a reign of terror, the object of which is to destroy both the League and the Colombo Mob completely.'" After a year of investigation the NYPD closed my father's case saying Johnson was a lone gunman. This was a theory inconsistent with Chief Seedman's previous certain belief that Johnson had not acted alone. The case was closed even though evidence showed Johnson was not capable of planning and executing such an elaborate plot alone. Johnson's immediate murder after he shot my father also went unsolved. The truth is Chief Seedman still believed this was all a mob hit as he later printed in his book, Chief. Daniel P. Hollman, then the Chief of the Joint Strike Force to Combat Organized Crime, agreed Johnson had not acted alone, but disagreed with Chief Seedman about the shooting and stated to the press he believed Johnson was not a mob affiliate. He noted how organized crime members would never send a crazed gunman shooting into a crowd of women and children. Like Chief Seedman and Agent Hollman, I have not been convinced Johnson was a lone gunman. I believe, just as they both did, there was a conspiracy in Columbus Circle the day of my father's shooting. The information in my book leans towards a more sophisticated plot arguing that certainly a conspiracy existed, but not one perpetrated by elements of organized crime. I know that not to be true. In the decades since the shooting not one mob informant, and there have been quite a few, has corroborated Chief Seedman's or the media's assertion it was a mob hit. An FBI plot to kill my Father? Possibly. Law enforcement's involvement? Most probably. Why the FBI? Why law enforcement? My father was a number one target of the FBI at that time. He had organized the Italian-American community in a way never seen. 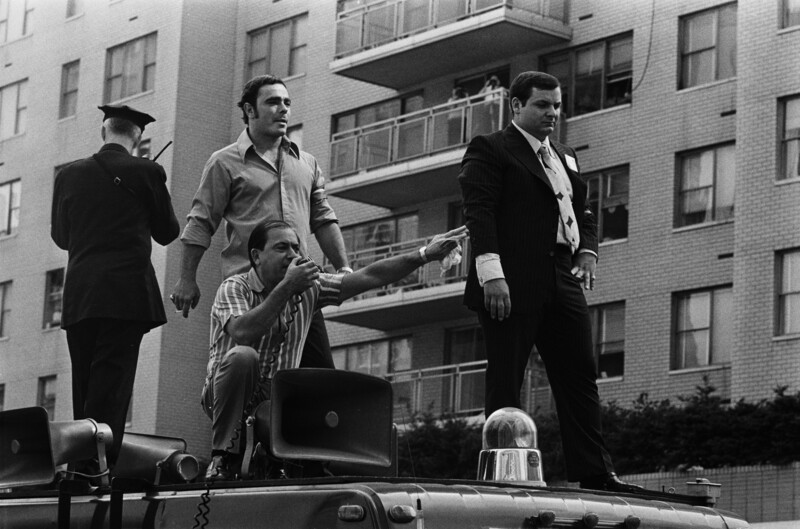 Within one year my father, through the Italian-American Civil Rights League, forced the U.S. Justice Department to eliminate the use of the words "Mafia" and "La Cosa Nostra", he shut down production of the film The Godfather, and rallied over 200,000 people in pickets and protests of the FBI. Despite the FBI's belief my father was a mob boss, he had criminal cases against him dismissed, and even a conviction reversed by the Supreme Court of the United States with the help of a brilliant young lawyer, Barry Slotnick. My father was beating the FBI in the street, with public opinion, and in court. My father (left with megaphone) and me (far right) organizing a protest of the FBI. The 1960s and 70s were a turbulent time in our nation's history. Evidence of FBI illegal activities leaked in 1971 when an FBI field office in Pennsylvania was broken into and the "Citizens Commission to Investigate the FBI" obtained internal FBI memorandum, which outlined an aggressive program of domestic spying. The program known as COINTELPRO (short for Counter Intelligence Program) was exposed. Agents executing the COINTELPRO program had their direct orders from then FBI Director, J. Edgar Hoover, and were required to "expose, disrupt, misdirect, discredit, neutralize, and otherwise eliminate" anyone viewed as subversive. There is no question my father was viewed as subversive. I personally experienced how the FBI treated him, myself, our family, and anyone close to us. I have lived with the question for over forty-five years of how far would Hoover and his agents go to "eliminate" a target such as my father? FBI internal memorandum demonstrates the FBI's concerted effort with at least one major media outlet, the New York Daily News, to vilify my father and destroy his reputation by running, "an article concerning Colombo and his associates, which will show just what a 'bum' he is". The Daily News agreed to leave no "trail" leading back to the FBI. These efforts by the FBI failed. My father's influence and power continued to grow. Is it hard to believe that the FBI, under then Director Hoover, would escalate the scale and scope of its efforts and utilize a more permanent method to destroy my father? I interviewed an ex-CIA case officer and asked him whether the FBI would eliminate someone of my father's position and he confirmed during those times agents infiltrated organizations, conducted dirty tricks, psychological warfare, and used the legal system, break-ins, stalking, assaults and beatings for harassment. They inflicted physical, emotional, and economic damage, and he believed they would not stop short of using assassinations to neutralize their adversaries. Today we not only hear more and more about illegal activities of law enforcement but also are shown hard evidence. My book finally reveals the major inconsistencies and suspicious sandbagging of the murder investigation that certainly would lead a reasonable person to question whether, as I long have, that elements of the NYPD, or the FBI were either involved in the shooting, or at the very least didn't want it solved. For example, Chief Seedman told the media during a press interview that the German pistol used to shoot my father was untraceable. Matching serial numbers in the ballistics report from the shooting, which was buried for forty years and only recently authorized for release, are revealed in the book saying something much different. It is clear the gun was in fact traceable, and, strangely, was missing from an NYPD evidence locker. Also suspiciously strange, infamous FBI informant, Greg Scarpa handed FBI agents a photo of a woman who eyewitnesses had identified as Johnson's female accomplice. She was being sought out by the NYPD for questioning for assisting Johnson with my father's shooting. However, the FBI buried her photo and did not turn it over to the NYPD. A clear obstruction of justice and evidence that they did not want this case solved. I am certain now more than ever that Johnson was not a lone gunman. My book offers the answers to the questions the media, the FBI, and the NYPD did not.